He blusters and grumbles. He rants and raves. He tries to outgun the school kids chasing after the bus on his route. But in his heart, Ed Crankshaft has a decent streak a mile wide. Patiently explaining death to his grandson Max. Comforting his friend Ralph as Ralph's wife descends into Alzheimer's. Thrusting flowers and candy at his son-in-law on a nearly forgotten wedding anniversary. The star of the hit comic strip Crankshaft is a gentle soul stuck in a cantankerous mood. With a supporting cast that includes Ed's two daughters, Chris and Pam; Pam's husband, Jeff; and their kids, Max and Mindy, Crankshaft appeals to families everywhere who steadfastly deal with intergenerational cares and conflicts. 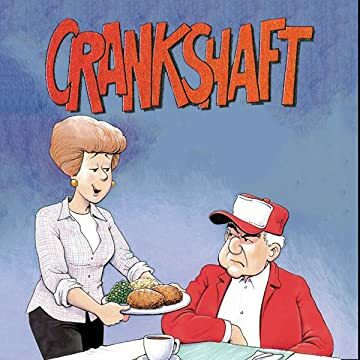 As one critic said: "Crankshaft is a witty, thoughtful commentary on the trials and tribulations of today's senior citizens." But, of course, Crankshaft is so much more. The strip's approach to Alzheimer's generated countless letters and e-mails, as did Crankshaft's near-death illness. 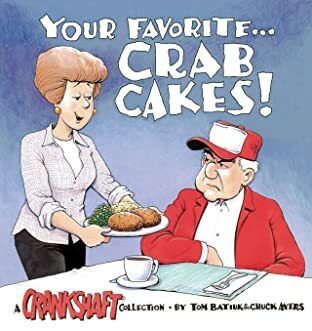 Hilarious and clever, honest and moving, Crankshaft both keeps readers laughing at the curmudgeon's pranks and pondering life's real meaning in this collection, Your Favorite...Crab Cakes! It's a balancing act that's rarely attempted in the comics--and with Crankshaft, it works admirably.